Beginning of the 1720s: disciple of Bandô Hikosaburô I, he started his career in Kyôto as an iroko. 11th lunar month of 1726: Toyosaburô became wakaonnagata in Kyôto, where he performed in the kaomise drama "Shinzô Kishi no Himematsu" which was produced by Sanogawa Mangiku. Fall 1730: Toyosaburô settled in Ôsaka. 11th lunar month of 1730: Toyosaburô performed in Ôsaka in the kaomise drama "Kunkoku Ôe no Kôbai", which was produced by Asao Motogorô I. Fall 1734: Toyosaburô went back to Kyôto. 11th lunar month of 1734: Toyosaburô played the role of Osome in the kaomise drama "Oyayuzuri Kogane no Katokugura", which was produced at Kameya Kumenojô's theater by Sakakiyama Shirotarô I. 3rd lunar month of 1738: Toyosaburô's rank in the Kyôto hyôbanki, wakaonnagata section, was jô-jô-(shiro)kichi (superior - superior - (white) excellent) [visual]. He shared the same rank with Onoe Kikugorô I. Fall 1738: Toyosaburô travelled to Edo with Tomizawa Tatsunosuke. 11th lunar month of 1738: Toyosaburô performed at the Kawarasakiza in the kaomise drama "Kotobuki Momiji Kagemasa". 1st lunar month of 1739: Toyosaburô's rank in the Edo hyôbanki, wakaonnagata section, was two black strokes above jô-jô-(shiro)kichi (superior - superior - (white) excellent) [visual]. 11th lunar month of 1739: Toyosaburô played at the Kawarasakiza the role of Yashichi's nyôbô Shirotae in the kaomise drama "Irifune Taiheiki", which celebrated the shûmei of Sakata Tôjûrô III. 11th lunar month of 1740: Toyosaburô played at the Nakamuraza the role of Saitô's daughter Hayasaki in Hayakawa Denshirô's kaomise drama "Miya Bashira Taiheiki", which celebrated the shûmei of Ichikawa Danzô III and Tomizawa Tatsujûrô; the role of Saitô Tarozaemon was played by Hayakawa Denshirô. 3rd lunar month of 1741: Toyosaburô's rank in the Edo hyôbanki, wakaonnagata section, was jô-jô-(hanshiro)kichi (superior - superior - almost excellent) [visual]. Fall 1741: Toyosaburô went back to Ôsaka. 11th lunar month of 1741: Toyosaburô became tachiyaku and played at the Ônishi no Shibai the role of Murakami Hikoshirô in the kaomise drama "Bankoku Taiheiki", which welcomed in Ôsaka the Edo actors Ichikawa Ebizô II and his adopted son Ichikawa Danjûrô III. 1st lunar month of 1742: Toyosaburô's rank in the Ôsaka hyôbanki, tachiyaku section, was jô-jô-(shiro)kichi (superior - superior - (white) excellent) [visual]. Premiere at the Ônishi no Shibai of the play "Narukami Fudô Kitayama Zakura"; Toyosaburô plays the role of Ono no Harukaze [casting]. 11th lunar month of 1742: Toyosaburô played at the Naka no Shibai the role of the karô Yûki Sensuke in the kaomise drama "Ukisuiwa Mukashi Kagami", which was produced by Anegawa Shinshirô I. 1st lunar month of 1743: Toyosaburô played the role of Kihei in the drama "Kurofune Isse Ichidai Otoko", which is produced by Anegawa Shinshirô I in Ôsaka at the Naka no Shibai [casting]. 1st lunar month of 1744: Toyosaburô's rank in the Ôsaka hyôbanki, tachiyaku section, was jô-jô (superior - superior) [visual]. 9th lunar month of 1745: Toyosaburô played the roles of Abe no Yasuna in the drama "Ashiya Dôman Ôuchi Kagami" , which is produced by Nakamura Jûzô I at the Ônishi no Shibai; his stage partners were Arashi Shichigorô I (Yakanpei, Shôgen), Nakamura Jûzô I (Dôman), Nakayama Shinkurô I (Yokanpei), Ichikawa Danzô III (Sakon Tarô) and Yoshizawa Ayame II (Kuzu-no-Ha). 11th lunar month of 1745: Toyosaburô played at the Naka no Shibai the role of Suruga no Jirô in the kaomise drama "Onna Musha Ukisu Gassen", which was produced by Ichiyama Sukegorô I. 1st lunar month of 1746: Toyosaburô's rank in the Ôsaka hyôbanki, tachiyaku section, was jô-jô-(shiro)hankichi (superior - superior - (white) half excellent) [visual]. 11th lunar month of 1748: he became zamoto and sakusha, using the pen name Toyoda Ittô, producing at the Naka no Shibai Namiki Shôzô I's kaomise drama "Fuyugomori Tsumagoi Ikusa". 11th lunar month of 1749: Toyosaburô played at the Ônishi no Shibai in the kaomise drama "Kotobuki Kogane no Kachi Ikusa", which was produced by Mimasu Daigorô I, welcomed back in Ôsaka Iwai Hanshirô III and celebrated the shûmei of Murayama Heijûrô IV. 1st lunar month of 1750: Toyosaburô's rank in the Ôsaka hyôbanki, tachiyaku section, was two black strokes above jô-jô-(shiro)kichi (superior - superior - (white) excellent) [visual]. 11th lunar month of 1750: Toyosaburô performed at the Kado no Shibai in the kaomise drama "Tachibana Gojûyongun", which was produced by Iwata Somematsu I; his main stage partners were Ichikawa Danzô III, Yoshizawa Sakinosuke II, Arashi Shichigorô I and Kirishima Gizaemon I. 1st day of the 1st lunar month of 1751 : his master Bandô Hikosaburô I died in Edo. 11th lunar month of 1752: Toyosaburô played at the Kado no Shibai the role of Nagoya Sanza in the kaomise drama "Nagoya Ori Hinatsuru no Nishiki", which was produced by Mimasu Daigorô I. 1st lunar month of 1753: Toyosaburô's rank in the Ôsaka hyôbanki, tachiyaku section, was three black strokes above jô-jô-(hanshiro)kichi (superior - superior - almost excellent) [visual]. 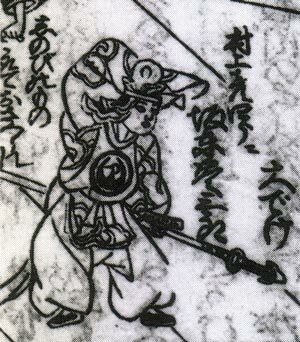 He shared the same rank with Mimasu Daigorô I, Ichikawa Danzô III and Sakata Tôjûrô III. 11th lunar month of 1753: Toyosaburô performed at the Naka no Shibai in the kaomise drama "Nakatomi Sandaijin", which was produced by Ichimura Sanohachi. 11th lunar month of 1755: Toyosaburô became zamoto and produced at the Naka no Shibai the kaomise drama "Jidai Sewa Kogane no Hanazoroe", in which he played the role of Shigetada. 1st lunar month of 1756: Toyosaburô's rank in the Ôsaka hyôbanki, tachiyaku section, was one black stroke above jô-jô-(hanshiro)kichi (superior - superior - almost excellent) [visual]. 11th lunar month of 1756: Toyosaburô played at the Kado no Shibai the roles of Kurofune Ihachi and Minamoto no Yoritomo in the kaomise drama "Taihei Yamato Monogatari", which was produced by Anegawa Daikichi I. 1st lunar month of 1757: Toyosaburô's rank in the Ôsaka hyôbanki, tachiyaku section, was jô-jô-(hanshiro)kichi (superior - superior - almost excellent) [visual]. He shared the same rank with Nakayama Bunshichi I. Fall 1757: Toyosaburô went to Kyôto. 11th lunar month of 1757: Toyosaburô played at the Minamigawa no Shibai the role of Ise no Saburô in the kaomise drama "Ôyashiro Musubu no Sanban Tsuzuki", which was produced by Sawamura Kunitarô I and Somematsu Matsujirô. 1st lunar month of 1758: Toyosaburô's rank in the Kyôto hyôbanki, tachiyaku section, was jô-jô-(hanshiro)kichi (superior - superior - almost excellent) [visual]. 11th lunar month of 1758: Toyosaburô played at the Minamigawa no Shibai the role of the kagokaki Tarôbê, in reality Tezuka Tarô, in the kaomise drama "Homare Musha Senri no Kachidoki", which was produced by Sawamura Kunitarô I and Somematsu Matsujirô. 11th lunar month of 1760: Toyosaburô played at the Minamigawa no Shibai the roles of the fox Aoba Hansuke impersonating Nagoya Sanza and Nagoya Sanza in the kaomise drama "Ôshimadai Kitsune no Mukoiri", which was produced by Sawamura Kunitarô I. 1st lunar month of 1761: Toyosaburô's rank in the Kyôto hyôbanki, tachiyaku section, was two black strokes above jô-jô-(hanshiro)kichi (superior - superior - almost excellent) [visual]. Fall 1762: Toyosaburô went back to Ôsaka. 11th lunar month of 1762: Toyosaburô played at the Kado no Shibai the role of Kinroku in the kaomise drama "Hachinoki Nendaiki", which was produced by Nakayama Bunshichi I and celebrated the shûmei of Arashi Sanjûrô III. 7th lunar month of 1763: Toyosaburô plays at the Kado no Shibai the role of Shiratayû in the drama "Sugawara Denju Tenarai Kagami"; his stage partners are Nakayama Bunshichi I (Matsuômaru, Terukuni), Nakayama Shinkurô I (Kakuju, Shihei), Arashi Hinasuke I (Haru), Anegawa Daikichi I (Tonami, Yae), Asao Tamejûrô I (Hyôei, Shundô Genba), Nakayama Raisuke I (Umeômaru), Fujikawa Hachizô I (Genzô, Sukune Tarô), Ichinokawa Hikoshirô II (Sakuramaru), Yoshizawa Sakinosuke II (Chiyo, Tatsuta) and Nakamura Kichiemon I (Kan Shôjô). 11th lunar month of 1765: Toyosaburô played at the Naka no Shibai the role of the bashi Sekihachi, in reality Kisanta, in the kaomise drama "Ôzatsuki Shuen no Kachidoki" , which was produced by Mimasu Daigorô I and Nakamura Utaemon I. He also played the roles of Hachimangû and the bashi Sekihachi in in the kaomise drama "Ôzatsuki Shuen no Kachidoki" , which was produced by Nakamura Utaemon I. 1st lunar month of 1766: Toyosaburô's rank in the Ôsaka hyôbanki, tachiyaku section, was two black strokes above jô-jô-(hanshiro)kichi (superior - superior - almost excellent) [visual]. He was the kanjiku for tachiyaku actors. 5th lunar month of 1766: first Kabuki adaptation of the 5 acts puppet theater drama "Honchô Nijûshikô", which is staged in Ôsaka at the Naka no Shibai; Toyosaburô played the roles of Kansuke's mother and Nagao Nyûdô Kenshin [casting]. 11th lunar month of 1767: Toyosaburô performed at the Kado no Shibai in the kaomise drama "Danjo Aishô Kagami", which was produced by Nakayama Raisuke I. 1st lunar month of 1768: Toyosaburô's rank in the Ôsaka hyôbanki, tachiyaku section, was two black strokes above jô-jô-(hanshiro)kichi (superior - superior - almost excellent) [visual]. He was the kanjiku for tachiyaku actors. 11th lunar month of 1768: Toyosaburô played in Ôsaka at the Kado no Shibai the role of the yakko Toyohei in the kaomise drama "Shin-yakata Banzei no Kotobuki", which was produced by Yamashita Yaozô I. 12th lunar month of 1768: Toyosaburô played at the Kado no Shibai the role of Chôgorô's mother in the drama "Futatsu Chôchô Kuruwa Nikki" . 11th lunar month of 1774: Toyosaburô appeared on stage for the last time, in Ôsaka at the Kado no Shibai, where he performed in the kaomise drama "Isagiyoshi Kusunoki Banashi". 3rd lunar month of 1775: Toyosaburô's rank in the Ôsaka hyôbanki, tachiyaku section, was jô-jô-(hanshiro)kichi (superior - superior - almost excellent) [visual]. Bandô Toyosaburô I was a refined and elegant actor, with the reputation of a talented musician. He was active from the beginning of the 1720s to the second half of the 1770s: wakaonnagata from 1726 to 1741 and tachiyaku from 1741 to 1774. He was the first actor in Kabuki history to play the role of Nagao Kenshin in the classic "Honchô Nijûshikô". The same drama was also staged at the same time at the Naka no Shibai. The competition for the best performance and the best line-up was open between the 2 theaters.